Reporting on a 1969 update of Americans' views about women in the workplace, George Gallup commented, "Rarely has the Gallup poll shown such a remarkable change in viewpoint." 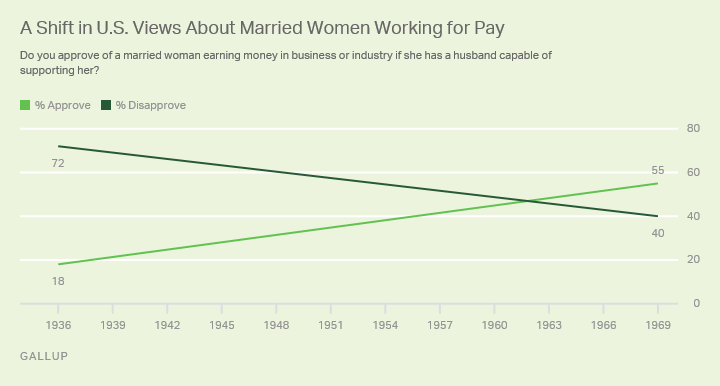 The change in question was a shift from 72% of Americans in 1936 saying they disapproved of a married woman working in business or industry "if she has a husband capable of supporting her" to 55% approving in 1969. George Gallup also noted that the timing of the 1936 poll, during the Great Depression when women would have been competing with men for scarce jobs, may have dampened Americans' support for women working who didn't need to. Regardless of the reason, 33 years later, the country had undergone a sea change in this aspect of gender equality. The 1969 Gallup news article discusses survey respondents' reasons for their views. Some of those against married women working for pay said, "A woman's place is in the home." Others thought that a rise in juvenile delinquency (which many at the time blamed on parents) could be traced to mothers working, and thus that women needed to be at home with their children. At the same time, some who approved explained their support by saying that having married women work helps with family bills and that it "keeps a woman busy" and "broadens her perspective." By way of example, the article quotes a Jericho, New York, housewife saying, "Too many women just sit home these days and let their minds go to pot. A job adds color, interest and satisfaction to a woman's life, not to mention the extra money." Others simply said it was a woman's right to work, or that it was up to the individual. Men and women expressed nearly identical views in 1969 about married women taking jobs, but adults in their 20s were more supportive than older adults. Given this generational pattern, attitudes continued to evolve -- as evidenced by a 1998 National Opinion Research Center poll updating the Gallup question. That survey found 81% of Americans approving and only 18% disapproving of a married woman earning money in business or industry if her husband was capable of supporting her. This is likely to have shifted even closer to unanimous approval today. 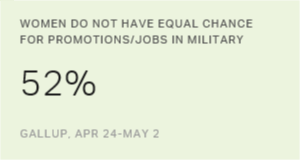 A slim majority (52%) of Americans think women in the military do not have as good a chance as men at promotions and jobs for which they are qualified. 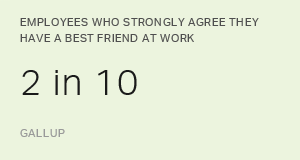 Is there a connection between having friends at work and employee performance? Absolutely -- especially for women.